Essie Neon 2015 Summer Nail Polish Collection. 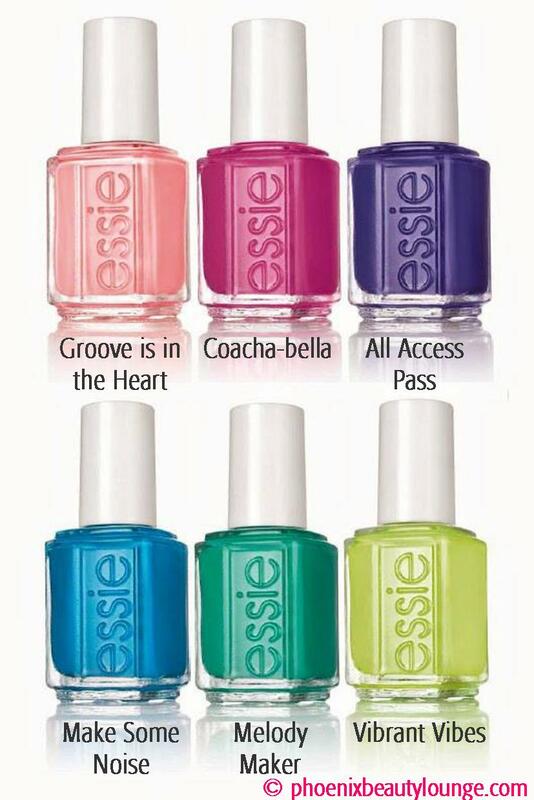 Essie is bringing back the neon hues this summer in a vibrant new collection perfect for flossing off your nails! The collection features six hot new shades ranging from neon yellow, to pink, purple and blue. Pack your bags, grab your friends, and hit the road: the Coachella music festival is coming. Sunny days and starry nights in the California desert are even more amazing with an endless parade of breaking bands, headlining acts and festival style galore. Whether you sway towards boho romance or have a penchant for punk, music festivals are the perfect place to showcase your edgiest looks. And what goes better with wristbands than shades – of polish, of course? Nothing. 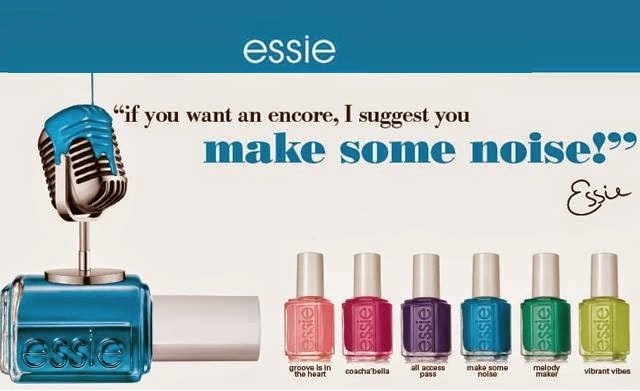 So, get ready to make your stylish mark and stand out in the crowd with street style-ready, eye-catching essie neons. Let’s be honest: the music is just an excuse to get together and look fabulous! The stars on stage are nothing compared to the throngs of fashion tastemakers in the stands. essay’s six new shades of neon boost your fashion quotient with amped colour that hits the perfect note of self-assured chic. Rave-worthy pink and turned-up electric blue create major impact. Ridiculously haute neon lime and it-girl magenta command attention in the stands and inspire likes, shares and instant social media mania. So, polish up and let the festival season begin! All Access Pass – Hey! Yo! Let’s go! This flirtatious boho violet indigo gets you in – here, there and everywhere. Coacha’bella – Yes! That’s you: best dressed at the fest in this stunning it-girl molten magenta. Groove is in the Heart – Don’t stop ’til you get enough! This wildly happy peachy pink neon is ready to rave all night long. Make Some Noise – Turn. It. Up. You’re loud, proud and absolutely on fire in this raucous electric blue. Melody Maker – Get on the mic. Make the scene. Work the crowd. You’ve got a hit on your hands in this deep lyrical teal. Vibrant Vibes – Can you feel it? This vivid neon lime is coming at you like a stadium-shaking sonic boom. Now available at Phoenix Beauty Lounge in store and online at http://phoenixbeautylounge.com/essie-neon-2015-make-some-noise/. This entry was posted in Collection previews, New Arrivals, Press Release, Product in Focus and tagged essie, Essie 2015 Collection, Essie Make Some Noise, essie nail polish, Essie Neon 2015, Essie Summer 2015, New Arrivals by phoenixbeautylounge. Bookmark the permalink.